Rewards Genius is a self-serve portal powered by Tango Card® that gives you the tools and transparency you need to manage your Zapier integration. Prior to using this guide, you’ll sign up for a free Rewards Genius account. Once you receive an invitation, you’ll set up your Rewards Genius portal and fund your account and create an email template. With that complete, you’ll reach out to sales@tangocard.com to request sandbox—and eventually production—API keys. 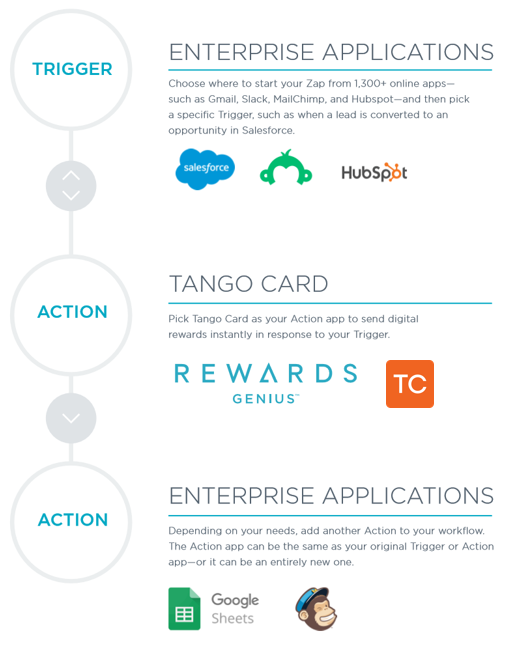 This guide walks you through how to finish setting up your Zapier integration by building the Zap—from Trigger to Action—in Zapier. Because the set-up for each enterprise application differs so greatly, we don’t address that part of the set-up process in this guide. Zapier enables you to link more than 1,300 web apps and easily pass information between them with workflows called Zaps. Automate the task of sending digital gift cards within your existing workflows and applications by using Tango Card’s web app within Zapier—no coding required! Learn how to create a Zap here!